Flipkart, India's largest online retailer plans to be a billion dollar revenue company in the next two to three years. The company is looking at Rs 500-600 crore in revenues in the current fiscal year, said Sachin Bansal, co-founder and CEO of Flipkart in an interview with Business Standard. This will be a big leap from the Rs 50 crore revenue the company generated in 2010-11. According to the company's CEO the firm is shipping out around 30,000 orders a day and has a user base of two million customers. 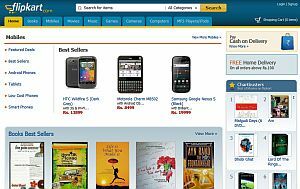 Sachin Bansal and Binny Bansal (not related) had launched Flipkart back in 2007 and initially the site was only selling books. After tasting success in books, the company diversified and added other product categories to their portfolio. As of now, the company plans to be present in all the categories, excluding groceries and automobiles. Eventually, the company also plans to enter the e-books space but is biding its time for now. According to Bansal, the company's focus areas include investments in supply chain and technology which translates into larger warehouses and increased automation of processes. The company also plans to add more numbers to its existing list of suppliers in India (which numbers 1,500) and abroad. Bansal is not perturbed by the entry of Amazon in the market and believes that the company will continue to hold their leadership position in India. The world's largest online retailer Amazon has set the ball rolling to enter Indian market soon. It is creating a local logistics backend in India in what would be a precursor to launching full-fledged operations to sell products in the country under amazon.in (more about that here). Flipkart itself has been strengthening its business through small ticket acquisitions. In 2010 it acquired book discovery tool WeRead from Lulu, a US-based on-demand publishing firm. This was followed by its acquisition of Mallers Inc (company's product Mime360 is an online digital media exchange platform), a company that is registered in US and Mumbai and then late last year it struck another deal in India when it acquired the digital catalogue of Chakpak.com, a Bollywood news site that offers updates, news, photos and videos. The company was the fourth most visited retail site (in terms of unique visitors) and the most visited Indian retail site in November 2011, according to data from comScore. More recently, the company had brought on board Karandeep Singh as chief financial officer (CFO) who was previously working with Sapient Corporation Pvt. Ltd as vice president (finance) and managing director where he led the India operations and was also part of the company's global leadership team. Meanwhile, we are still waiting to hear Flipkart raising the bar in terms of e-commerce valuations in the country. We had earlier reported how the firm is eyeing $1 billion valuation in the next round of funding. The funding deal is not signed yet but we could be hearing something soon on that front. Flipkart had earlier raised $20 million in its series C round of funding from New York-based Tiger Global Management LLC which had took the total to $31 million for the company.